Lancashire Distribution supplies Dura Edge PVC edgebanding to finish the exposed edges of most types of indoor furniture and cabinetry. 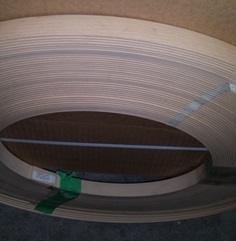 Dura Edge covers size requirements from 5/8” to 7-14’ widths and from .016” to 3/16” thickness with color availability to match all of the major North American melamine and HPL manufacturers. Please contact your local Lancashire Distribution office for your match.